The Wayne Township Board of Zoning Appeals will hear an application for a variance to minimum accessory structure setbacks submitted by Lance Pritchard for 9042 Valdosta Way. Plese join us for good food--for a good cause! FREE SCRAP TIRE COLLECTION OPPORTUNITY! This event is open to all residents of Warren County free of charge. We ask that all tires be removed from the rims. Tires will not be accepted from businesses. Please be advised that it is a felony in Ohio to travel with more than 10 tires in your vehicle unless you are a registered scrap tire hauler. If you are caught will more than 10 tires your vehicle can be impounded. Please note that DP&L will have crews from Fitzwater Tree Service Inc. trimming trees that interfere with power lines. 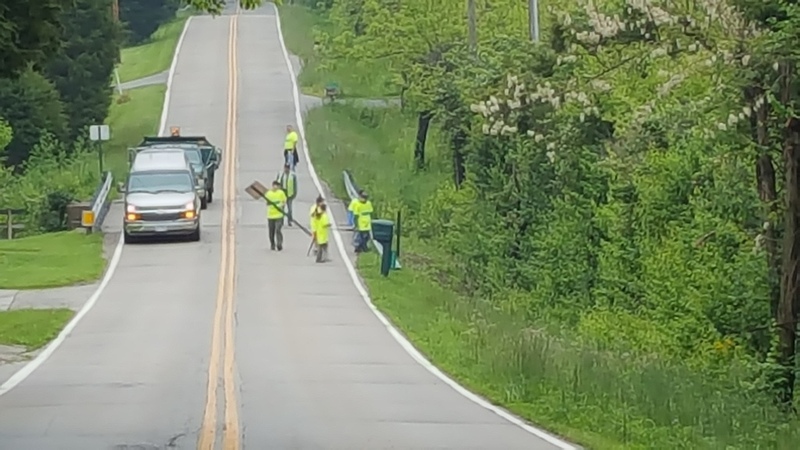 They will be working in the area north and west of our Waynesville substation, which is located at Bellbrook Rd just south of Henderson Rd. If you have general questions you can contact Dayton Power and Light at 937-331-3900 or visit www.dpandl.com for more information. CLOSED on Friday, February 1 for staff to attend off site training. Offices will reopen on Monday, February 4th at 8:00 am as usual. closed on Tuesday, January 1 in observance of New Years Day. We wish you all a Happy and Safe 2019! closed on Tuesday, December 25 in observance of Christmas. The Wayne Township Zoning Commission will hold a public hearing on Thursday, November 1, 2018 at 7:00 p.m., at the Wayne Twp. Administration Building, 6050 N. Clarksville Rd., Waynesville, OH, to take public comment in consideration of a rezoning application filed by KRF Holding LLC. The applicant seeks to rezone their property located at 7392 E. State Route 73 from Recreational "C" to Commerical "B-3" permissive of agritourism, event/recreational facility (indoor), park/recreational facility- outdoor (active), driving range/golf course, play sets, game courts, and office/wholesale business. The Wayne Township Board of Trustees will hold the second public hearing, taking public input, on Tuesday, November 20 at 7:30 pm at the same location. The Wayne Township Board of Trustees will hold a public hearing on Thur., October 16, 2018 at 7:30 p.m., at the Wayne Twp. Administration Building, 6050 N. Clarksville Rd., Waynesville, OH, to take public comment in consideration of a rezoning application filed by David Brixey. The applicant seeks to remove a previously approved residential PUD overlay and revert back to the base zoning of R-1 (Residence Single Family Zone). The Wayne Township Zoning Commission will hold a public hearing on Thur., October 4, 2018 at 7:00 p.m., at the Wayne Twp. Administration Building, 6050 N. Clarksville Rd., Waynesville, OH, to take public comment in consideration of a rezoning application filed by David Brixey. The applicant seeks to remove a previously approved residential PUD overlay and revert back to the base zoning of R-1 (Residence Single Family Zone). The Wayne Township Community News Magazine has space for local and regional businesses looking for advertising opportunites in the Waynesville, Wayne Township, Harveysburg, Spring Valley, Clearcreek, Centerville and Oregonia areas. The full-color Wayne Township Community News Magazine is produced twice per year with the next edition due to hit nearly 6,000 local mailboxes in early October. The intersection of Old SR 122 (CR 230) and Township Line Road (CR 134) will remain closed for an additional three (3) weeks until Friday, September 7th, weather permitting. The extension of the closure is due to unforeseen utility relocations and weather delays during the construction of the Old SR 122 and Township Line Road Intersection Improvements Project. Administrative Offices will be closed on Monday, September 3rd in observance of Labor Day! Offices will reopen regular hours on Tuesday. The Wayne Township Board of Trustees will hold a public hearing on Tuesday, July 17, 2018 at 7:30 p.m., at the Wayne Twp. Administration Building, 6050 N. Clarksville Rd., Waynesville, OH, to take public comment in consideration of a rezoning/Village Transition Planned Unit Development (VT PUD) application filed by John Federle. The applicant seeks a VT PUD overlay permissive of more dense single family residential development than otherwise permitted in the current Rural Residential zone located at 5615 Lytle Rd. in addition to 1.29 acres to the rear of 5621 Lytle Rd. August 16, 2018 @ 7:00 p.m. The Wayne Township BOard of Zoning Appeals will hear an application for a variance to minimum accessory structure setbacks submitted by William Filbrandt for 8118 Madrid Blvd. August 14, 2018 @ 9:30 am. Sealed bids will be received by the Administrator of the Wayne Township Board of Trustees, Warren County, Ohio, 6050 N. Clarksville Rd., Waynesville, OH 45068, until 1:00 p.m., July 16, 2018, at which time bids will be opened and read aloud for the “Chip Seal” resurfacing of eight (8) miles, more or less, of township roads located in Wayne Township, Warren County, Ohio. Specifications for said work may be obtained by calling (513) 897-3010 x , clicking here, or emailing Gus Edwards at gusedwards@waynetownship.us. If you need additional information on this chip seal project, please contact Mr. Edwards. By order of Wayne Township Board of Trustees, Warren County, Ohio. Public Officials, design professionals, construction teams and engineers officially broke ground on Wayne Township's new Fire Station No. 2 today! The Board of Trustees have moved their regularly scheduled public meeting from July 3rd to July 10 @ 7:00 p.m. The Wayne Township Zoning Commission will hold a public hearing on Thur., July 5, 2018 at 7:00 p.m., at the Wayne Twp. Administration Building, 6050 N. Clarksville Rd., Waynesville, OH, to take public comment in consideration of a rezoning/Village Transition Planned Unit Development (VT PUD) application filed by John Federle. The applicant seeks a VT PUD overlay permissive of more dense single family residential development than otherwise permitted in the current Rural Residential zone located at 5615 Lytle Rd. in addition to 1.29 acres to the rear of 5621 Lytle Rd. Administrative offices will be closed Wednesday, July 4th in observance of Independence Day. 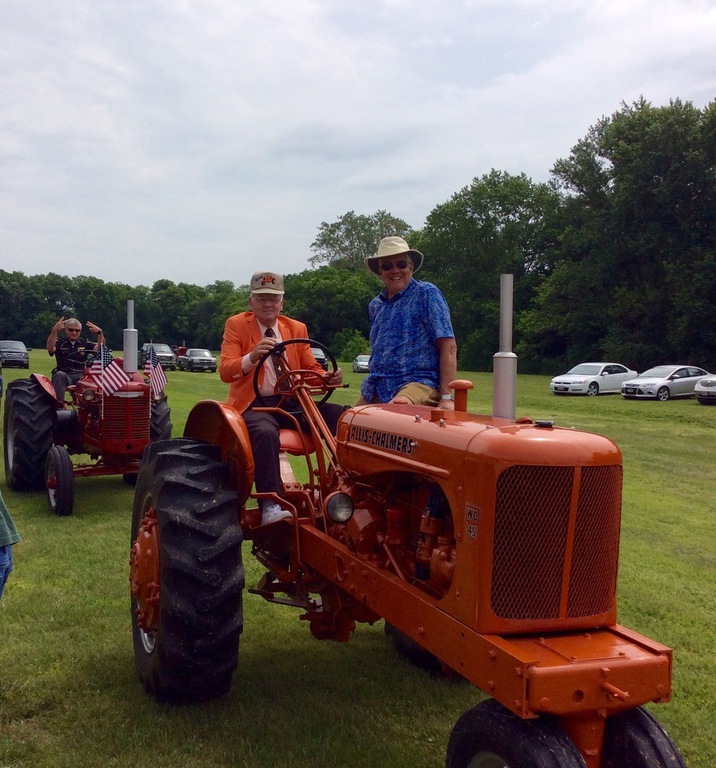 Bring your own tractor and join the fun, or just come to watch and enjoy lunch provided by Davidson's Meat (pig roast) and dessert from the Village Family Restaurant and Tractor Club Members. Wayne Township Administrative Offices will be closed on Monday, May 28th in observance of Memorial Day. A Memorial Day ceremony honoring fallen soldiers will be held at Miami Cemetery in Corwin on Monday at 11:00 am. Pence-Jones Rd. closed for bridge replacement beginning the second week in July. Road will be closed for 4-6 weeks. The detour for this closure is Roxanna-New Burlington Rd. and Wilson Rd. Thank you to Major Steve Arrasmith, Commander of the Warren County Drug Task Force, for sharing with Wayne Township the sucesses and challenges facing the Warren County area. For more information and further educational matierals regarding current illict drug trends in the Warren County area, please click here for the WCDTF's website. Click here to read the 2018 State Issues Report, which includes ballot language, and explainations with arguments both for and against the issues. The Wayne Township Board of Trustees have scheduled a work session meeting. Monday, April 30, 2018 at 5:30 PM. Purpose of the work session: To review Fire and EMS operations with Massie Township Trustees and/or officials. The Board of Zoning Appeals will hold a Public Hearing to consider a Conditional Use for an existing, non-conforming single family dwelling located at 4966 N. US Rt. 42. Several roads in Wayne Township have recieved a surface treatment called "chip-seal". Chip Sealing is a common pavement maintenance practice that extends pavement life and provides a good driving surface. It is a multi-step process that necessitates loose stone on the road surfaces while the treatment settles. Extra loose stone will be swept from the roadways beginning the week of the 18th. Plese join us for good food for a good cause! Cold weather brings the risk of accidental fires and carbon monoxide dangers. Are you doing everything you need to stay safe? Wiith cold weather looming, the Warren County Engineer's Office has proclaimed Nov. 4th, "Shake Your Mailbox Day" for Warren County Residents. Check out their tips to protect your mailbox from snow plow dangers and protect yousrself from potential liability. Daylight Savings time begins Sunday, March 11 at 2:00 am. Don't forget to set your clocks ahead an hour. It's also a great time to change the batteries in your smoke detectors too! The Wayne Township Board of Trustees have scheduled a special meeting. Friday, March 16, 2018 at 1:30 PM. Purpose of the meeting: To review bids and GMP from the Schueler Group for the Fire Station No. 2 project. The Warren County Township Association announces a $1,000 scholarship opportunity for Warren County High School Seniors. The deadline is February 23--so act fast! Wayne Township Administrative Offices will be closed on Monday, February 19 in observance of President's Day. In order to better serve our residents, Administrative Offices will be closed February 1-2 so that staff can pursue continuing education opportunites. Administrative Offices will be closed Monday, January 15 in recognition of Martin Luther King Jr. Day. Offices will reopen Tuesday the 16th. December 29 @ 12:00 p.m.: The Wayne Township Board of Trustees will hold the final open meeting of the year. The meeting had been previously advertised for December 31 at 12:00 p.m.
November 5th: Don't forget to turn your clocks back for Daylight Savings Time. Its recommended that you change the batteries in your smoke detectors at the same time. December 19 @ 7:30 p.m.: The Wayne Township Board of Trustees will hold a public meeting to take public input on and make a decision regarding a text amendment to Article II, Chapter 4 (Groundwater Protection Overlays) and additionally expand the definitions in Artilce IV accordingly of the Wayne Township Zoning Code. Proposed language was inspired by feedback from the Warren County Combined Health District and the Ohio EPA. December 13 @ 6:30 p.m.: The Wayne Township Board of Trustees will hold a speical meeting for the purpose of discussing the 2018 Health Insurance Contract & Work Session for the purpose of reviewing Fire and EMS coverage into Massie Township on a Mutual Aid Basis. Massie Twp. Trustees have been invited. No other items will be discussed. December 7 @ 7:00 p.m.: The Wayne Township Zoning Commission will hold a public meeting to take public input on and make a recommendation to the Board of Trustees regarding a text amendment to Article II, Chapter 4 (Groundwater Protection Overlays) and additionally expand the definitions in Artilce IV accordingly of the Wayne Township Zoning Code. Thursday, November 23: Wayne Township Administrative Offices will be closed in honor of Thanksgiving. Administrative Office Closed: Friday, November 10th. Wayne Township will be closed on Friday, November 10th for Veterans Day to honor all the brave men and women who served in our military. Corwin Ave. between SR 42 and New Burlington Rd. Middletown Rd. between Corwin Rd. and Middletown Rd. at the Little Maimi River. Roadways will remain closed until officials deem the roads safe for travel. 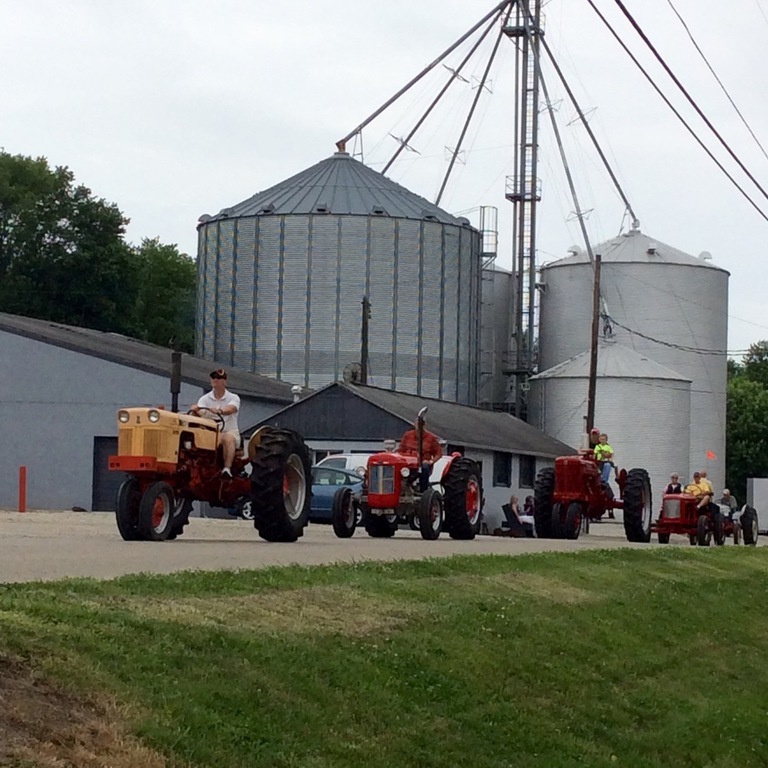 Bring your tractor and join, or just come to see a wide variety of antique tractors while enjoying great food! Purpose: Work Session to review fire station design and preliminary pricing. No other items will be discussed. The Wayne Township Board of Trustees will hold a special Public Meeting on Thursday, April 27 at 3:00 pm to consult with legal counsel. Several roads in Wayne Township have recieved a surface treatment called "chip-seal". Chip-Sealing is a common pavement maintenance practice that extends pavement life and provides a good driving surface. Formerly closed since the second week in July for 4-6 weeks for bridge replacement. Public Notice: Please be advised that the Wayne Township Zoning Commission, Warren County, OH, will be holding a Public meeting to evaluate the need for amendments to the Wayne township Zoning Code on September 7th, 2017 at 7:00 pm at the Wayne Township Administration Building located at 6050 N. Clarksville Rd., Waynesville, OH 45068. Public input and/or comments are welcomed and encouraged. Public Notice: Please be advised that the Wayne Township Board of Trustees, Warren County, OH, will be holding a Public Hearing on proposed amendments to its Future Land Use Map on September 19th, 2017 at 7:30 pm at the Wayne Township Administration Building located at 6050 N. Clarksville Rd., Waynesville, OH 45068. The Wayne Township Board of Trustees will hold a special Public Meeting on Monday, April 10 at 6:00 pm to review quotes for rates on electric aggregation and determine the lowest or best rate provider. Mosquitoes becoming a nuisance? While the Township does not have a comprehensive mosquito management program, there are steps you can take at home to keep the pests at bay. Click here. The Ohio Township Association (OTA) is pleased to announce Erin Hartsock, Zoning Inspector and Asst. Administrator from Wayne Township in Warren County, as a recent graduate of the OTA Leadership Academy, an advanced local government training program. The Ohio Township Association Leadership Academy (OTALA) was created in 2003 to provide education to elected officials, township staff, employees and appointed individuals. Through the joint efforts of the OTA, OSU Extension: Office of Community Development and Miami University’s Center for Public Management and Regional Affairs, the program offers courses designed to enhance the leadership and decision making skills of those involved in Ohio township government. “All politics are local, but Township government is truly the most local form of government in the US. We all strive to serve our neighbors and communities to the best of our abilities. The OTALA program helps us all by encouraging an environment of continuous improvement and inclusion,” said Hartsock. In order to complete OTALA, all participants had to attend the General Workshop, participate in six of ten elective courses and take part in the National Association of Towns and Townships (NATaT) Annual Conference, held each year in the spring in Washington, D.C. or the OTA Federal Day Workshop held at the OTA offices in Blacklick, Ohio. All requirements must be met within three years of beginning the program. Ms. Hartsock joins the ranks with Mr. Pat Foley, Mr. Bradley Coffman and Mr. Gus Edwards as Wayne Township Officials who have graduated from the OTALA courses and continue to benefit from its educational opportunities. Ohio’s 1,308 townships and more than 4,000 associate members. Board of Zoning Appeals will hold a hearing on Thursday, July 20th at 7:000 pm to consider a conditional use application for the installation of an attached accessory dwelling (Mother-in-law suite) to be located at 5234 O'Neall Rd. Please contact the Wayne Township Administrator with questions. The Wayne Twp. Zoning Commission will hold a public hearing at 7:00 p.m. on Thur., June 1, 2017, at the Wayne Twp. Administration Building, 6050 N. Clarksville Rd., Waynesville, OH, to consider a rezoning application filed by Linda Hice. The applicant seeks to rezone four partial parcels (05071760140, 05071260120, 05071260130, 05072000020) totaling 26 acres, all fronting SR 73 north of Old Route 73 from R-1 residential and B-2 “Community Commercial” to exclusively B-3 “Regional Commercial”. Celebrate Independence Day in the Village of Waynesville! Administrative Offices will be closed on Tuesday, July 4th in recognition of Independence Day. Memorial Day: Administrative Offices will be closed Monday, May 29th in recognition of the our service men and women who made the ultimate sacrifice while serving our Country. Local Official receives Ohio Township Assosciation Leadership Academy Diploma. Click here for more infromation. It has been a long process, but I am happy to share that the revision of the Wayne Township Zoning Code is nearly complete. While minor adjustments may still be made before official adoption as a result of public feedback, it is ready for for the public to review! The full copy of the proposed new text may be found at here. Wednesday, December 14: 6:30-8:00 pm. Thursday, February 2: 7:00 pm. Tuesday, March 7: 7:00 pm. An additional benefit of beet juice is its ability to effectively treat roadways in very cold conditions. Whereas salt is most effective in temperatures above 15-20 degrees F, beet juice lowers the freezing point of water to as low as -20 degrees F. For instance, a study performed by the Missouri Department of Transportation found that at 30 degrees F, or just below freezing, one pound of salt alone is capable of melting about 46.3 pounds of ice. But at zero degrees, this same amount of salt will only melt about 3.7 pounds of ice. ODOT urges motorists to drive to the condition of the road and use caution during winter weather. Before you leave home, check road conditions and live web cams at www.ohgo.com. County Soil and Water Conservation Districts to increase reforestation efforts throughout the region. 513-695-1337 with any questions or issues with the ordering process. 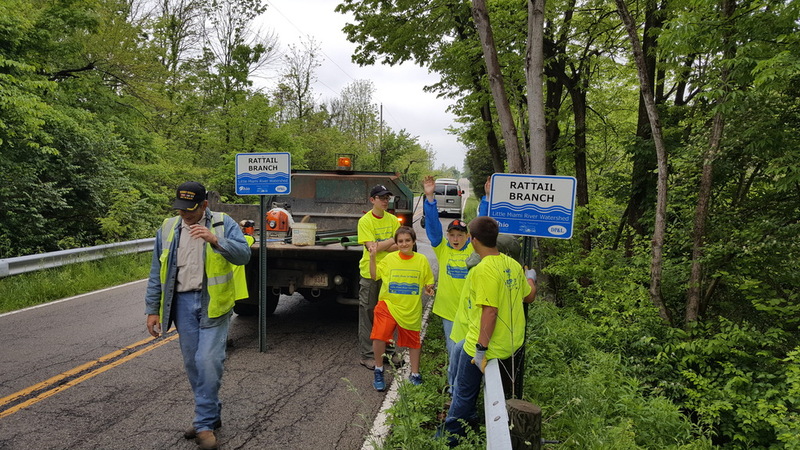 Thank you to Waynesville Boy Scout Troop 51 for all the hard work. It was a damp and chilly Saturday morning…surely the weather that keeps most people indoors under a blanket. 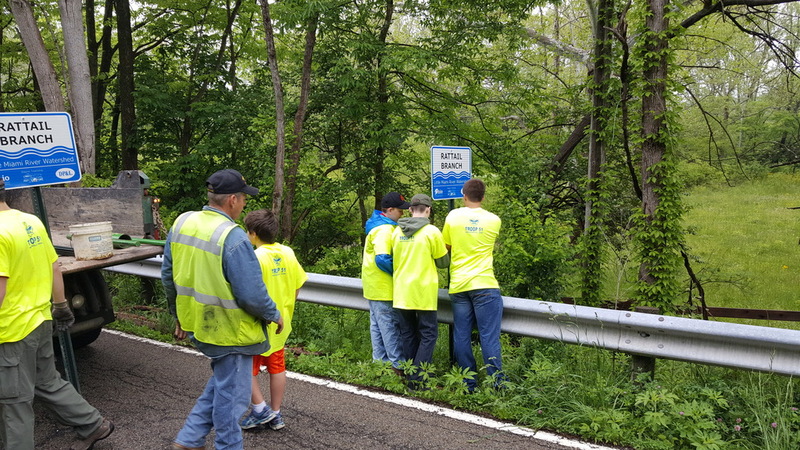 The boys were such hard workers, Troop 51 is the very definition “troopers”! 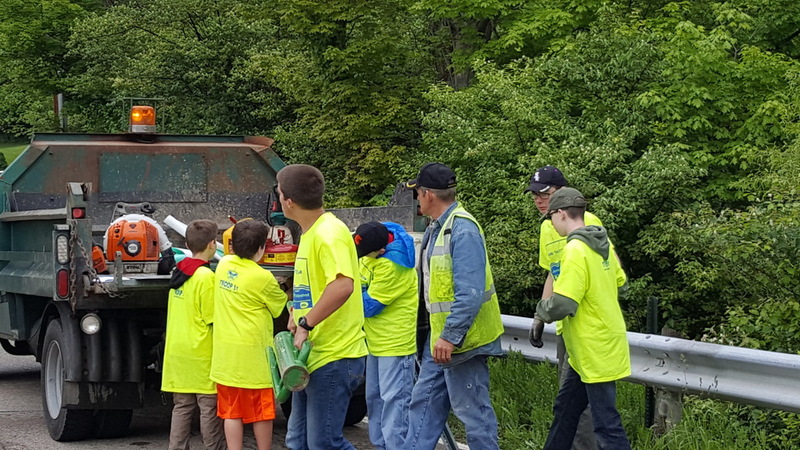 The 2016 Recycle Rally was a sucess! Thank you to all the partners and participants for coming out on a cold, damp and windy Saturday! We served 108 residents, collected over 200 tires, two compacter trucks full of bulk trash, a dumpster of assorted scrap metal and much more. A special thanks to the Village of Waynesville, Rumpke, John Boyd Heating and Cooling, LCNB, River Metals and Wayne Township Administration. Garrett Schroeder of Wayne Township received the 2016 Warren County Township Association Award. 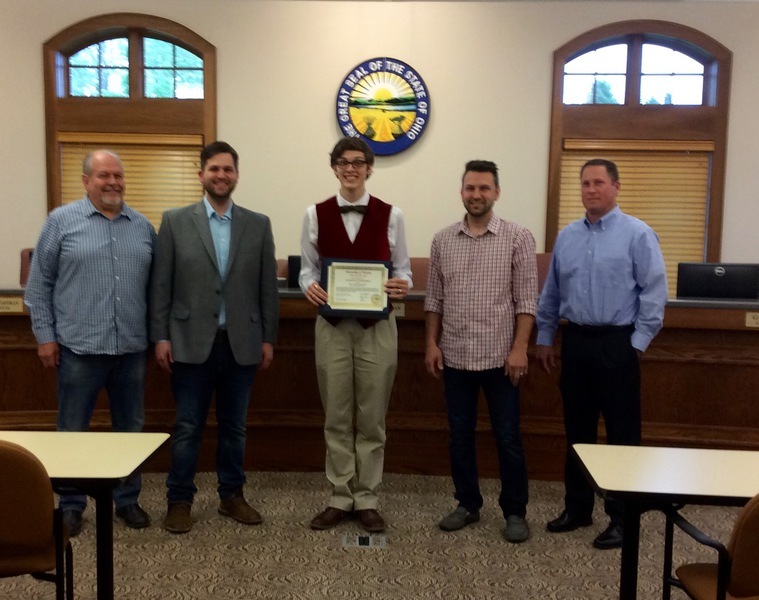 The Warren County Township Association awards an annual $1000 scholarship to a student in Warren County who displays both academic achievment as well as outstanding citizenship through service and participation in community activities. Entries were received from across the County. Competition was strong and the review process strict. Once vetted to ensure the applicants met all the academic and civic requirements, applications were then reviewed and ranked by the Warren County Prosecutor's Office. Congratulations Garrett. You have made Wayne Township proud! Administrative Offices will be closed on Monday, May 30th in observance of Memorial Day. Re-opended (as of 11/19/2015) Elbon Rd. Lebanon, Ohio – Wayne Township - The Warren County Engineer’s Office announces that it is closing the Elbon Road Bridge #234-0.45 starting tomorrow morning, Tuesday, November 10, 2015, for three (3) weeks, weather permitting. The bridge is located on Elbon Road between Corwin Road and Gard Road in Wayne Township and crosses over a branch of the Little Miami River. The bridge repair was planned for December of 2015, but after a recent bridge inspection showed increased deterioration of the stone arch structure, the repair work has been rescheduled to start immediately. Traffic will be detoured from using the bridge utilizing Corwin Road and Gard Road. The Warren County Township Association presents a One Thousand Dollar ($1,000.00) Annual Scholarship to the student who has at least a cumulative GPA of 3.0 and attained a 22 ACT and/or 1000 SAT score. You must be able to demonstrate outstanding citizenship through service and participation in community activities. 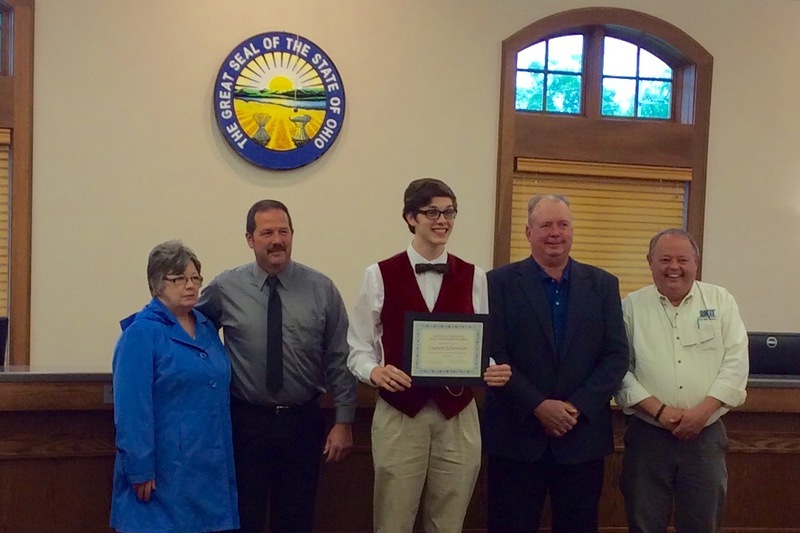 This is the first year that the Warren County Township Association has offered a scholarship. Please pass this along to any senior in high school who meets the requirements. Please e-mail fred.vonderhaar@untwp.com or wallacefortrustee@gmail.com if you have any questions. RE-OPENED (effective 11/19) 5178 Elbon Rd. Emergency culvert replacment. See the News tab for more information and progress pictures. Updated Nov. 13th. Administrative Offices will be closed on Wednesday, November 11th in observance of Veterans' Day. Variance application for 7729 Carter Dr.
Wayne Township will begin a series of public meetings focused on gaining public input for a Zoning Code revision. The first meeting will be held on Wednesday, August 26th at 6:00 p.m. at the Wayne Township Administration Building. The second Trustees' Meeting in July will be held on Monday, July 20th at 7:00 p.m. rather than the regular Tuesday to allow Wayne Township Officials to more actively particpate in Fair activities.